Today: The moment we've been waiting for -- The Food52 Cookbook, Volume 2 is here! This week marks an important moment for our community and for our company. In 2009, we set out to create a new kind of online food site and community -- one that would be inspiring, curated and most important, participatory. We hoped to attract great cooks from all over who could come together to share not only their excellent recipes, but their cooking insights, product suggestions, beautiful photography, and witty comments! We wanted it to be a beautiful place where people were nice to each other, where we'd feel inspired, and where we'd learn and become better, more confident cooks. We got started with cookbooks -- we wanted to create a new kind of cookbook, one that was crowdsourced and curated, and we figured if that went well, then perhaps we were onto something. We signed on with Harper Collins to make two cookbooks over the course of two years. For the first 52 weeks, we ran two themed recipe contests a week to come up with the winning recipes for the first book. And then just before we collapsed from exhaustion, thanks to Merrill's wise thinking, we trimmed back to one contest a week for the second book. During the second 52 weeks, we refined our process, involving the growing Food52 community even more in the process of testing recipes, suggesting themes, and voting. We also worked on our food styling and the book design, toning down the colors and letting the food do the talking -- much as it does here on the site. This week, the second volume came out and, although we're biased, we think it's a beauty! There are 75 recipes, hundreds of photos, helpful comments from Food52ers who have made the recipes, and menus galore. We hope you like it. Most of all, we're proud of what we've done together as a community. We've made two great books, and a site that's so much better than what we even imagined. We look forward to our future projects, but for now, we raise a glass to you! The best christmas present that Ive ever received! The gift that keeps on giving as I make meals from it at least once a week! We're blushing -- thank you! My copy was waiting for me from Amazon when I returned from the US a week ago. It has been beside me as I have been healing from various ailments collected when traveling in the US. Love the organization by seasons, love the recipes and especially love the care taken with the detailed index in the back. Congratulations to Amanda and Merrill for their vision and energy. Huge congratulations and admiration to all the cooks who have contributed. You are an inspiration to us all. May I also say a warmest thank you to every engaged cook who participates in the online community that is food52. Bless you all. Ladies you have done a beautiful job with Volume 2. I am so proud that our recipe of Afghan Dumpling (pg. 194) in this book. I wrote a post about this honor in my blog and my readers all the way from Afghanistan are responding about hoe excited they are to have one their national dishes in your book. Last week a box of 5 of the Food52 cookbooks arrived at my house because of the potluck party we are having in January. I brought a copy to my mom, who is ailing, in Evanston. She is too sick to cook but is enjoying the design, pictures, and recipes. :)) I think the photography is better than the first book. I luv book design and don't feel an e book is the same. Love you all @Food52 - so excited about the second book! Thanks, all, for your lovely compliments about the book -- it's really all of you who deserve the congratulations!! Merrill, is there going to be a book tour this year? Hoping I could see you guys again in Darien. And ditto, to all the lovely comments. These books are treasures. It's another beauty...so good that I can't figure out where to start cooking from it. Congratulations to all who make Food52 such a fab community. I just went on Amazon and ordered three--one for me, and two for my sisters-in-law. Can't wait to get it. Maybe someday I'll bring mine to NYC and have you guys sign it! Looks like a beautiful book! Can't wait to rifle through the pages and be inspired. Congratulations! Hip hip hooray! Congratulations to all! Congratulations to everyone in the F52 community that contributed to Volume 2! Amanda and Merrill, are you by chance doing any book events in the Boston area? Do you know about the planned Boston book potluck planned for 1/27? Hi Cheese1227 - no, I hadn't heard about it. Can you let me know where I can find out more about it? Thanks! Alas, we won't be in Boston for any events, but hope you can make it to the potluck! Congratulations to Amanda and Merrill and the F52 community; I've ordered several for family around the globe and am about to order more! Congratulations to Amanda & Merrill and to everyone who had a part in creating another wonderful book!!! It is such a great honor (not to mention the bragging rights) to be a member of the Food52 family!!! 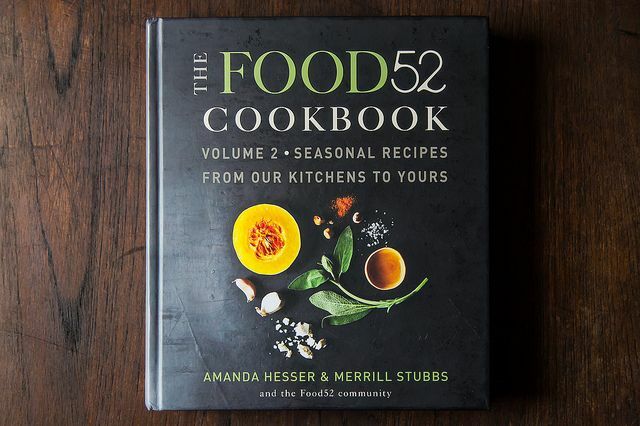 Just got my copy yesterday, love it!..waiting for the book signing sessions like last year to get my copy signed by Amanda & Merrill..I joined Food52 around the time these Vol. 2 contests were halfway through. Its like reliving the moments of each weeks contest all over again! Congrats Amanda & Merrill & the Food52 team & here's wishing you another James Beard! I've been checking my amazon.com account to see when it'll ship. I'm impatient!!! Congratulations on the new cookbook! I am also new to Food52 and hope to purchase this beautiful looking book. Bravo! I can't wait to get the cookbook! I'm new to the Food52 community, and so far, I'm loving every minute of it. WE. ARE. SO. THRILLED! Congratulations on the production of this second masterpiece. What a great job you did. And what an honor to be a part of the Food52 family, too. If you go to the Amazon link they have a "look inside" hyperlink that lets you see a ToC brief but a full listing of the index. that will give you a good read on what's inside!